As is usual with FI's, these are all presented in PDF format. You'll need to use your browser's back key to return to Karkee Web after accessing them. 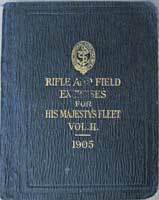 Note: Both 1901 and 1904 editions of RIFLE AND FIELD EXERCISES FOR HIS MAJESTY'S FLEET; Vol. I are known to have been produced. KW would love to see the relevant sections of these issues. Can any reader help? 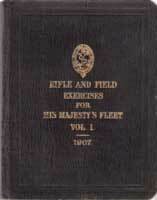 These Fitting Instructions were taken from RIFLE AND FIELD EXERCISES FOR HIS MAJESTY'S FLEET; Vol. II - RIFLE PRACTICE INSTRUCTION, LANDING PARTIES, AND FIELD FORTIFICATION, 1905; and comprise Part II, The Landing Party. From the John Bird Collection. 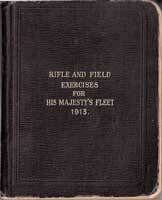 These Fitting Instructions were taken from RIFLE AND FIELD EXERCISES FOR HIS MAJESTY'S FLEET, Vol. I - RIFLE AND FIRING EXERCISES, SQUAD, COMPANY AND BATTALION DRILL, 1907; and comprise Appendix II, Accoutrements for Seaman. From the Karkee Web Collection. 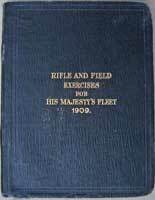 These Fitting Instructions were taken from RIFLE AND FIELD EXERCISES FOR HIS MAJESTY'S FLEET, 1909, and comprise Part XII, Accoutrements for Seaman, of that document. 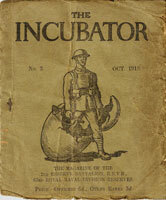 The text is identical to the 1907 edition, although it has been reset and a few typos corrected. The Plates are (apparently) identical as well. From the Graham Tweeddale Collection. These Fitting Instructions were taken from RIFLE AND FIELD EXERCISES FOR HIS MAJESTY'S FLEET, 1913, and comprise Part XIV, Accoutrements for Seaman, of that document. These differ only slightly from the 1909 FI's listed above. From the Karkee Web Collection. 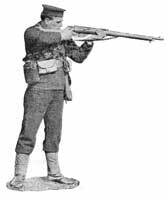 Also taken from RIFLE AND FIELD EXERCISES FOR HIS MAJESTY'S FLEET, 1913, these plates are part of Part VIII, Musketry Instruction. They provide good period illustrations of Patt. '01 in use. From the Karkee Web Collection.